Schaefer’s solid-body pallets are superior in design and performance. Structurally molded of high-density polyethylene, these rugged, lightweight plastic pallets are easy to clean, won’t splinter, rot or corrode and deliver years of unmatched performance. AIAG pallets have 48" × 45" usable deck dimensions with 4-way pallet jack and forklift entry, smooth deck with 4-sided retaining lip, seat belt option and are nestable for efficient storage. NF Pallet - Krypto-Lite™ Schaefer introduces the Krypto-Lite™ automotive pallet. The Krypto-Lite™ exhibits the strength, stiffness and deflection performance of the mid-duty 4845 pallets, but with 25% less weight. Weighing under 32 lbs, it can be lifted by a single worker. Tested for superior stiffness and impact resistance. AF Pallet: The AF pallet is the original industry standard plastic pallet. Made of structural foam, it is rugged and durable. 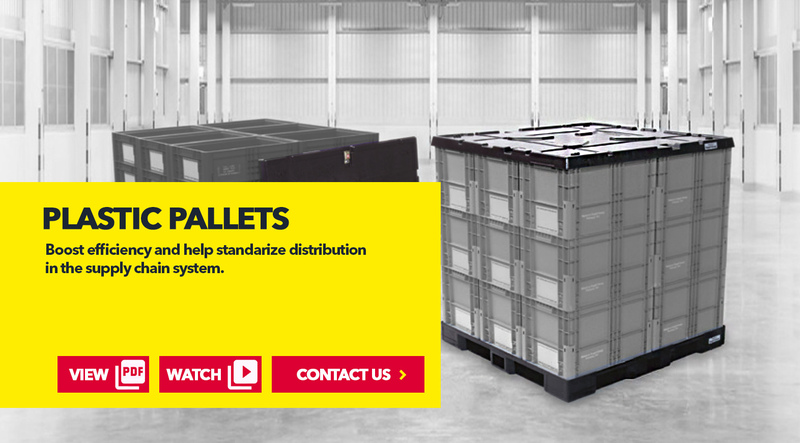 Lightweight, user-friendly design reduces pallet-related injuries. Schaefer is continuously working to expand its product offering to become a true, single source for all material handling and transport needs. This includes our complete line of reusable plastic pallets and top caps. 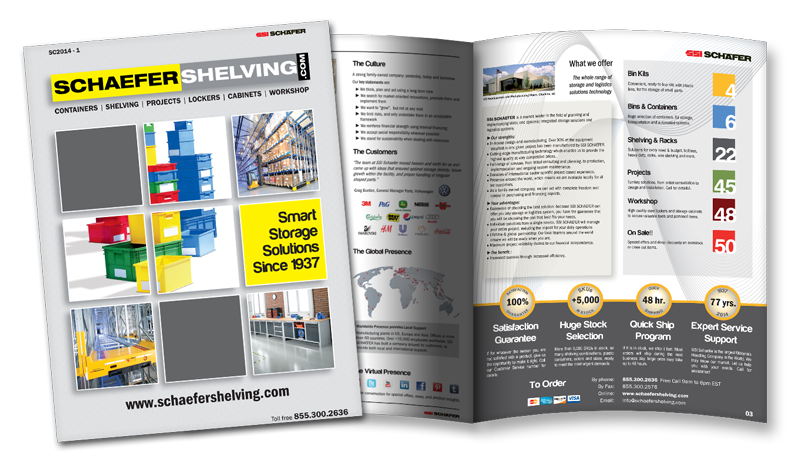 Schaefer's solid-body pallets are superior in design and performance. 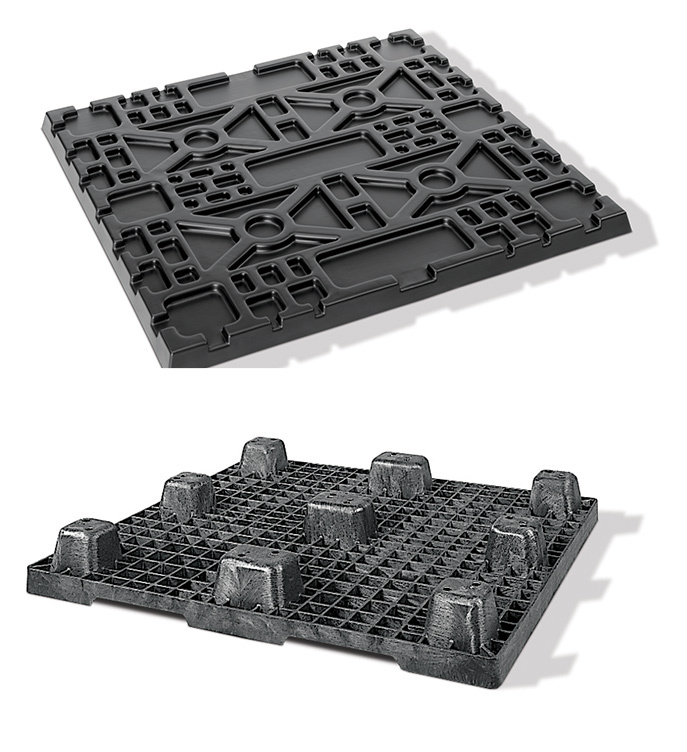 Structurally molded of high-density polyethylene, these rugged, lightweight plastic pallets are easy to clean, won't splinter, rot or corrode and deliver years of unmatched performance. And when they do reach the end of their usefulness, they can be recycled, helping to preserve the environment. These pallets not only protect product, they protect employees because of their lightweight, user-friendly design. That means reduced pallet-related injuries, increased employee productivity and a better bottom line. When performance counts, count on the plastic pallets that save time, space and money year after year. The AIAG top caps have a 48" × 45" usable dimension and are used to top off a palletized set of bins or an AIAG bulk box. The top caps allow secure multi-level stacking of loads. They have provisions for strapping or seat belts and nest for efficient storage. NF Top Cap - MultiStac™ Schaefer introduces the MultiStac™ automotive topcap. 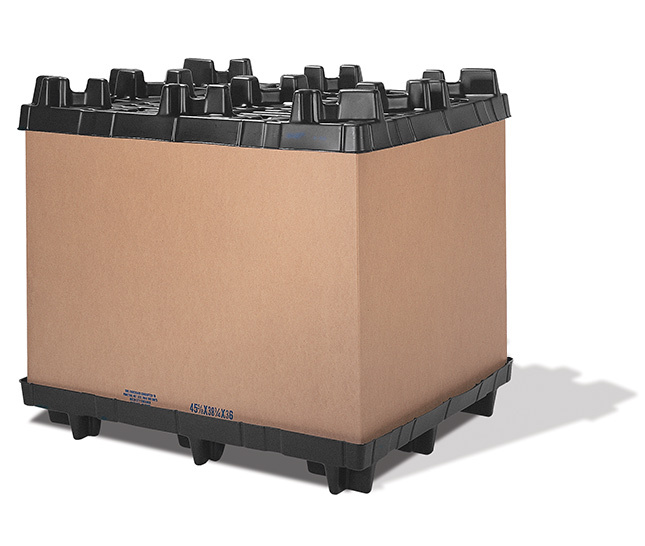 Molded of 100% recycled material, the MultiStac™ is designed to work with palletized bins, bulk boxes and steel racks. 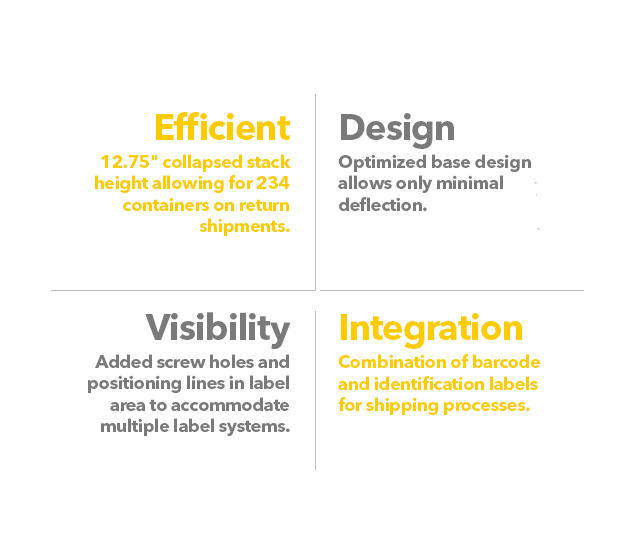 This compatibility allows for mixed loading and storage, allowing maximum flexibility for staging components. Limitations: A MultiStac™ on a bulk box cannot accept a load of palletized bins and it is never to be used on top of a steel rack. The different allowable stacking configurations are listed below the NF Top Cap table. AF Top Cap The AF top cap is vacuum-formed and will accept seat belt buckles. It is designed to work with both the AIAG 4845 pallets and Schaefer's NFP 4524 half pallets. 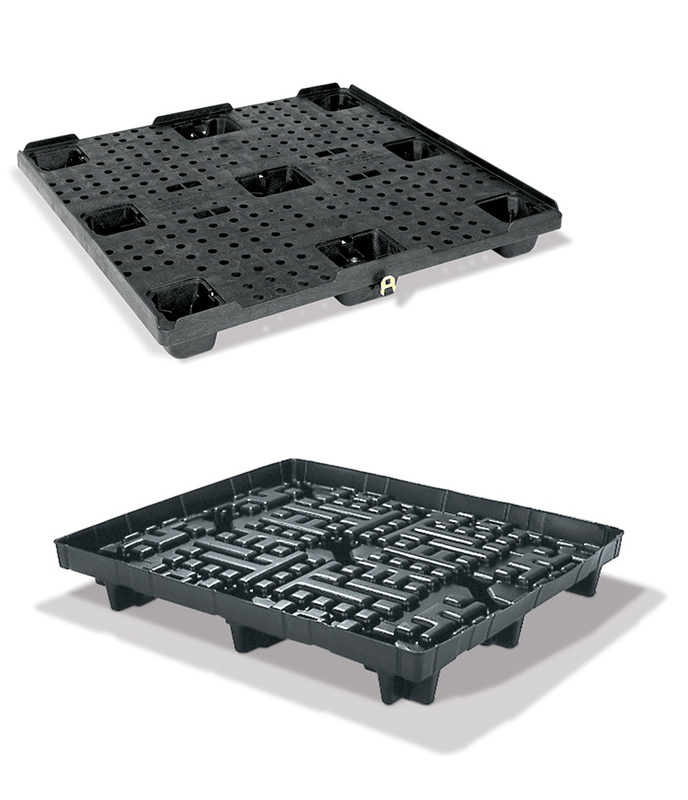 The AF Half Pallet and Top Cap are designed to provide maximum flexibility within the 48" × 45" footprint. In conjunction with our AF line of totes, this half pallet system serves as a smaller, more maneuverable delivery system for inventory within storage and assembly facilities. Utilized with the cardboard or plastic corrugated sleeves, the half pallet system is ideal for applications that do not require the strength nor the volume of a collapsible bulk box. For storage convenience, this duo mixes seamlessly with 4845 palletized loads: two AF Half Pallets will fit side-by-side on an AFT 4845. Watch SSI SCHAEFER Plastic Pallets in action! Overview of all the capabilities of our plastic container manufacturing, product line, and custom dunnage solutions. We develop innovative products and made-to-measure solutions that provide our customers with the efficient organization of their goods for storage and transport. Our range assures our customers of short, direct routes to products and solutions.